Off-Camera TTL Flash Cord for Canon Cameras (3') is rated 4.7 out of 5 by 465. Rated 5 out of 5 by Joel from Great alternative to the Canon brand I wondered how something this inexpensive could possibly replace the much more expensive original. Fear not, this product is ruggedly constructed and performs as advertised. The camera end is identical to the Canon unit in features, construction and appearance, The connecting cord is exactly the same as the Canon's. The big improvement is at the flash end, where the non-locking and flimsy shoe on the Canon OC-E3, which broke in normal professional use is replaced by a very sturdy locking shoe with a standard knurled locking knob. It also has a standard tripod threaded socket for stand mounting. Without a doubt buy this item with confidence. Rated 5 out of 5 by Jeff from Excellent Quality This was the highest quality camera cable accessory I have ever personally purchased. Every aspect of this item's construction was top notch: the shoes, shoe tightening/latching mechanism, cable thickness & flexibility, the electrical contacts on both ends, the sturdy construction of the shoe including a plated metal base plate. Tremendous value! Rated 5 out of 5 by David from Sturdy I'll be honest- I've only used this cord a few times thus far. I will say though, that this cable seems to be very heavy duty. The cord is thick and heavy. The foot slider lock is the same as on the Canon 600EX-RT, and it connects to my 5DmkII in the same way. When the flash is sitting atop the receiving end of the cord, the cord receiver is screwed onto to the Vello Straight Flash Bracket, and the cord transmitter is secured into the camera's hot shoe, there's just enough slack for easy access to flash, lens and camera. For this set-up, any other length wouldn't be as good. All in all, I really like this flash cord. Rated 5 out of 5 by Mark from Quality TTL Cord & A Good Value I bought the Vello TTL-Off-Camera Flash Cord for Canon EOS to use with my Powershot SX40 and Speedlite 270EX II flash. Cord appears to be of good quality construction and provides the same functionality as having the 270EX attached directly to the camera's hot shoe. I got the 3' (1 m) cord so I could use the flash on a bracket. Glad I didn't go shorter. As noted on the specifications tab, the 3 foot cord is only 9 inches long when relaxed. Definitely recommend the Vello TTL cord for anyone getting a flash as it lets you get the flash off the hot shoe for better portraits and macro photography. A lot of added flexibility for a very reasonable additional cost. Rated 5 out of 5 by TommyDee from TTL cord works perfectly with Canon G15 I bought this TTL cord to facilitate using my Sunpak RD2000 flash off-camera with my Canon Powershot G15. It works perfectly and is a nice length for hand holding the flash to side-light the subject or bounce off of the ceiling when shooting in portrait mode. When installed on the camera, the cable protrudes from the front of the camera, but it doesn't seem to be too much of a problem as long as you don't accidentally get the cable in your frame. I would prefer the cable to exit toward the rear of the camera, but it's no big deal either way. Both TTL and manual flash control work perfectly through the camera's menus. Rated 5 out of 5 by James from Great improvement I am a loyal Canon user and in the past two years have ordered about two dozen of their Off Camera flash cords and had to replace about 80% of them as they break where the flash attaches. I ordered ONE Vello cord to see what the quality was like and will be ordering another two dozen of the Vello cords as the quality is far superior for more than half the price. Canon.... pay attention!!!!! Rated 5 out of 5 by Michael from A Great Low-Priced Atlernative The Vello off-camera cord works very well. It is solidly built and does the job it's supposed to. I am very happy with its construction and performance. I shoot a variety of events and I haven't any issues to date, although I haven't used it heavily yet. This is the 4th off-camera cord I have purchased. I have a Canon OEM OC-E3, I bought two inexpensive generic ones on an auction site and now the Vello. I bought the Vello because of the good reviews and because the two auction versions worked well but were not well built. (Both of them broke apart at the seams and had to be glued together. I used them until they broke so badly I couldn't secure them any longer.) The Vello off-camera cord is a great product. It does what the Canon OC-E3 does for a fraction of the price. Rated 5 out of 5 by Steven J from It's not complicated but it works. This isn't a complicated thing and it works just fine.? I have nothing to complain about so far. One end goes on the camera's hotshoe and locks down and the other end takes the flash.? The flash end also has a standard 1/4-20 socket on the bottom of it which I have a wrist strap attached to so I can let my speedlite hang from my wrist. You can also screw it onto any standard 1/4-20 socket like the top of a tripod head or light stand. This TTL cord makes all of the necessary connections between the camera and the flash so I get all of the automatic and control features available.? It just has to work and it does. Does this work on a ricoh gr II ? the 1/16 piece of plastic that is at the bottom of the flash seat (connects to my bracket) keeps snapping off at the screw hole. this is a poor design. how can i fix/replace this? i've bought 3 vello cords-this will be my last unless i can fix the problem. Is this cord compatible with the Canon 600RT flash? My Canon T3i supports e-ttl but the cords seem all to saw ttl but compatible. Am I losing the e when using these cables? I use the Vello off camera cord on a rotating bracket with a Canon 50D and Speedlite 580EXII or 430EXII. The LED on both flash units display E-TTL. I could not recreate your situation where the E drops from the display. I am assuming that the flash fires correctly and gives you a good photo? I would see if the same thing happens using another flash. If it does, then it may be a glitch with the cord. Then I would try another cord. I am on my second Vello cord. The first one lasted about 2 years. I got a new one and its working fine. Good luck. Do I need to purchase a hot shoe adapter with the Vello TTL off camera flash cord to work with the Canon Rebel T-3 and the Canon 60D? I'm using a Speedlite 430X II. 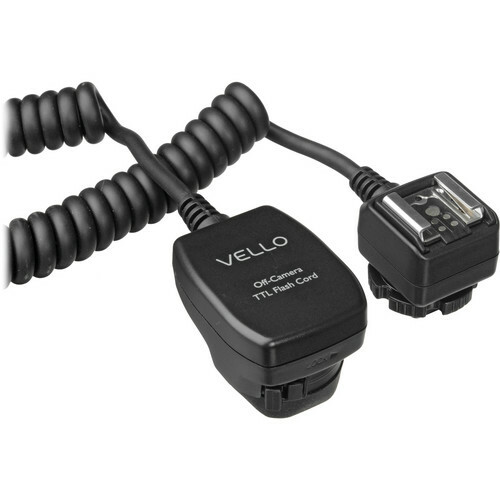 You do not need an adapter to use the Vello TTL-Off-Camera Flash Cord for Canon EOS with the T3 and 60D. The cord is compatible with both cameras and the 430EX II flash. Is this compatible with the Olympus OMD-EM1 and Olympus 600r flash? Is it compatible with the Fuji XT1 ? Will this cord work with the Canon 600 EX-RT in E-TTL mode, or will it work with the speed lite only in manual mode? Yes, you should have no problem using E-TTL with this cord. I have several of them and they all work great.